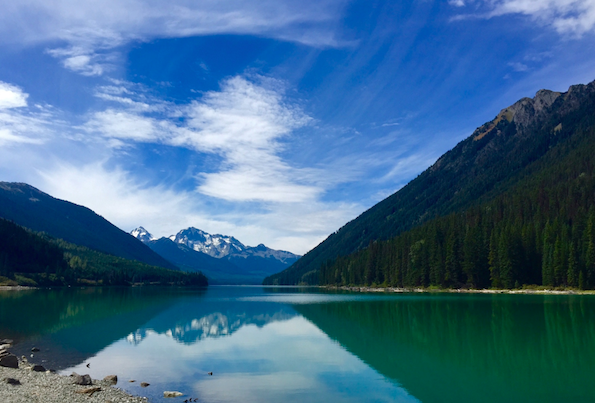 There is so much to draw a traveler to the peaceful and serene Kootenay area.The slogan for our province is “Beautiful British Columbia” and that aligned with the truth. Whether you want to disappear into nature, take that round of golf you never have time for in your fast paced everyday life, or go on an adrenaline adventure, there is much to meet your desires. With the abundance of attractions, it’s no surprise that we have guests stay a couple weeks with us. The Riondel Golf Course is a beautiful 9 hole course located on Kootenay Lake’s East Shore, just 10 minutes fro the Kootenay Bay ferry landing. The course was started in 1961 by volunteers, most of whom worked or had family who worked in the Bluebell Mine. What started off as only three holes, eventually transformed into the friendliest 9 hole course in the Kootenays! Conveniently located 2 minutes from the property. Kokanee Springs is considered Norman Woods’ masterpiece. Carved from the wilderness and situated along the base of the Purcell Mountain range, Kokanee Springs has been regarded as the flagship of golf courses in the Kootenays. Only 15 minutes from the property. Situated above the majestic shores of Kootenay Lake, Balfour, British Columbia, is home to one of nature’s most scenic golf courses. This unique 18-hole layout combines excellent tee-to-green playing conditions, a warm and welcoming atmosphere and a stunning mountain back drop to provide one unforgettable golf experience.More golf course to offer on the other side of the lake. The Kootenay Lake ferry runs across Kootenay Lake, 35 kilometers east of Nelson on Highway 3A, between Balfour (west side) and Kootenay Bay (east side), 70 kilometers from Creston on Highway 3A. A breathtaking 35-minute ride on Canada’s longest free ferry service. The Ktunaxa First Nations peoples embraced the nupika wu’u, or hot mineral waters, for their healing and rejuvenating powers and Ainsworth Hot Springs has been welcoming guests since the 1930s. 2 minutes from the property (sorry, no moorage). Find all the unique crafts and locally grown produce at the cutest market around. 15 minutes from the property.